When a child dies or is seriously injured, the lives of families and entire communities are changed forever. But these tragedies don’t have to happen. The important thing to remember about preventable injuries is that they are preventable. They often occur in predictable ways and can be completely avoided with the right education, awareness and planning. Safe Kids works with an extensive network of more than 600 coalitions in the United States and partners with organizations in 23 countries around the world to reduce injuries from motor vehicles, sports, drownings, falls, burns, poisonings and more. Since 1988, when Safe Kids was founded by Dr. Marty Eichelberger of the Children’s National Medical Center with support from founding sponsor, Johnson & Johnson, there has been a 55 percent decrease in the unintentional injury rate among children 19 years and younger. But losing one child is one too many, and we don’t want any parent to have to endure the loss of a child. That’s why we’re calling on everyone to come together, to raise awareness and to get involved so we can ensure that all children around the world have the chance to grow up healthy and safe, and do all the great things kids were meant to do. ﻿﻿﻿﻿Sa﻿﻿fe Kids Worldwide is a global nonprofit organization founded in 1988 by Children's National Medical Center with a mission of preventing unintentional childhood injury, a leading cause of death and disability for children 1-19. Since its founding, Safe Kids Worldwide has contributed to a 55% reduction in U.S. child fatality rate from unintentional injury. Safe Kids Thurston County was founded in 1997 with the same mission. 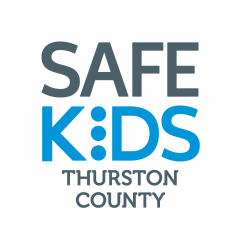 Safe Kids Thurston County programs and initiatives combine education, awareness, environmental changes, and safety device distribution in local communities.